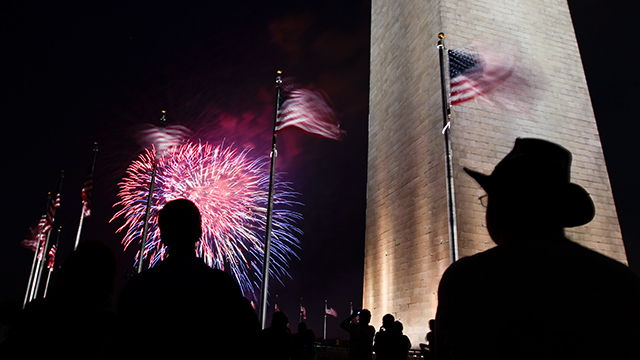 As the U.S. prepares to celebrate Independence Day, Americans remain overwhelmingly positive about their nation’s relative standing in the world, according to a new Pew Research Center survey. A majority of the public (85%) says either that the United States “stands above all other countries in the world” (29%) or that it is “one of the greatest countries, along with some others” (56%). 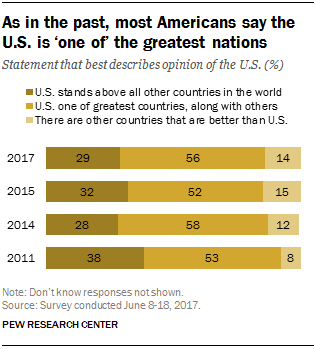 Only 14% of Americans say there are “other countries better than the U.S.” These views have changed little in recent years. 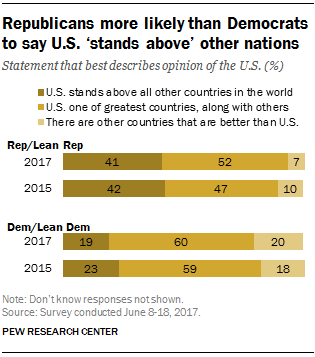 As in the past, Republicans are more likely than Democrats to say the U.S. “stands above” all other nations, according to the survey, conducted June 8-18. About four-in-ten Republicans and Republican-leaning independents (41%) say the U.S. stands above other countries, compared with 19% of Democrats and Democratic leaners. This is nearly identical to the partisan gap on this question in the fall of 2015. Among both Republicans and Democrats, however, majorities place the U.S. among the greatest nations, rather than saying it stands above others or that other nations are superior. In the new survey, 60% of Democrats and 52% of Republicans say the U.S. is one of the greatest countries in the world, again little changed from 2015. While the view that there are countries better than the U.S. is uncommon in either party, Democrats and Democratic leaners remain more likely than Republicans and leaners to say this (20% vs. 7%). These views, too, are largely unchanged from 2015 (18% vs. 10%, respectively). Both parties are divided ideologically in views of the nation’s global standing. Nearly half of conservative Republicans (47%) say the U.S. stands above all other nations, compared with 30% of moderate and liberal Republicans. Among Democrats, just 13% of liberals say the U.S. stands above other nations, compared with 23% of moderate and conservative Democrats. And nearly three-in-ten liberal Democrats (29%) say there are other countries better than the U.S.; only 13% of conservative and moderate Democrats say the same. As has been the case in past Pew Research Center surveys, older Americans are more likely than younger Americans to see the U.S. as one of the world’s greatest nations – and there is a particularly wide age gap in perceptions of the U.S. as exceptional. Adults 65 and older are the most likely to say the U.S. stands above all other nations (44%). By contrast, just 12% of those younger than 30 say the same, the lowest share in any age category. There is little difference in views of the nation’s global standing by race and ethnicity: About three-in-ten whites (30%) and blacks (31%) and about a quarter of Hispanics (26%) view the U.S. as above all other nations. The majority view across each of these groups is that the U.S. is a great country, on par with some other countries. Across educational groups, roughly equal shares consider the U.S. a top-tier nation. But those with higher levels of education are somewhat less likely to say that the U.S. stands above all other countries and more likely to say the U.S. is among the world’s greatest nations, along with some others. Among those with postgraduate degrees, 20% say the U.S. stands above all other countries, while 64% say it’s among a few great nations. By comparison, a third (33%) of Americans with a high school diploma or less consider the U.S. the best country in the world, while 52% say it is among the world’s greatest nations. Laura Thorsett is an intern focusing on U.S. politics and policy at Pew Research Center.